Do we have a good one for you today – the Samsung Galaxy S9 Plus goes up against the Huawei P20 Pro. Both of these devices represent Samsung’s and Huawei’s flagship smartphones. One could argue that the Galaxy Note 8 is Samsung’s best effort to date, but the Galaxy S9 series is their mainstream device. What is exciting about the comparison is the fact that both devices look so modern and are packed with technology, with one notable difference being the inclusion of a notch on Huawei’s phone. Here we have two devices, probably the two best-looking smartphones on the market, each stocked full of technology and features. Which one is the better purchase by offering the most technology for the least amount of money? These is the type of question we will attempt to answer. First, we will go through some of the aspects they have in common. The Galaxy S9 Plus and the Huawei P20 Pro do have a few things in common – or at least very similar. We can start with the physical size of the devices being so close, with the S9 Plus weighing only 9 grams more. Their displays are almost identical in size with 18.5:9 and 18.7:9 aspect ratios, Gorilla Glass 5, and the use of an always-on display for notifications, although the P20 Pro’s version is a little more rudimentary. They use a different brand, but equally powerful processor/GPU combo, 6GB of RAM, and both offer a model sporting 128GB of storage, although only the Galaxy S9 Plus offers expandable storage. Both offer multiple cameras – two on the S9 Plus and three on the P20 Pro. Both offer large non-removable batteries with a fast charging capability, but only the S9 Plus offers wireless charging. These devices share the usual Wi-Fi, Bluetooth (v5.0 on the S9 Plus and v4.2 on the P20 Pro), a 3.1 USB Type-C reversible port for charging and data transfer. Both offer Google Pay, IP68/IP67 water and dust-resistance, Hi-Res Audio with stereo speakers, a desktop mode, facial recognition, and Android Oreo. 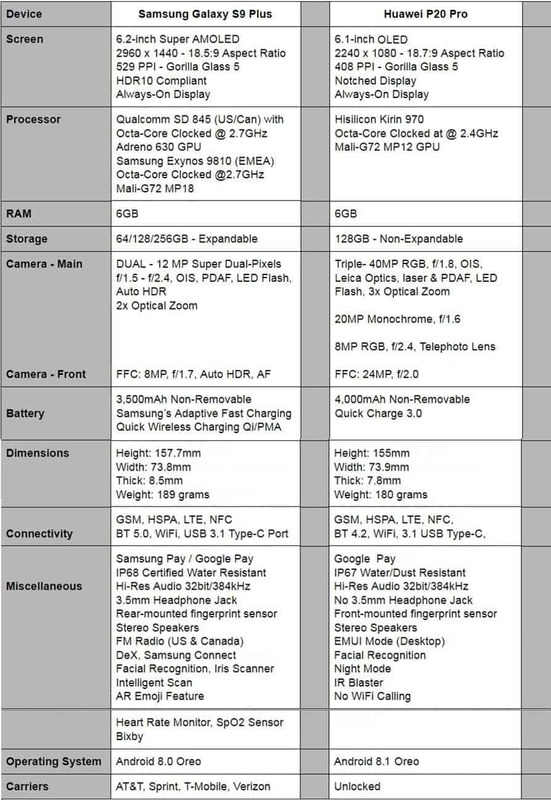 Please take a careful look at the detailed specifications comparison chart below and you will see just how these two high-end smartphones stack up against each other. After that, we will look at each mobile offering in more detail and point out some of its pros and cons. From all of this information, we will try to determine the winner based on overall specs, as well as the execution of design and functions. The Samsung Galaxy S9 Plus is more evolutionary than revolutionary – the big design change was done last year, resulting in more of a refinement approach with the S9 Plus. For instance, slight design changes where the curve of the display meets the metal frame make it easier to pick up and hold the phone without accidentally opening an app. Two of the most exciting additions are the long awaited stereo speakers and a dual camera setup – found only the S9 Plus model. Intelligent Scan uses both the facial recognition and iris scanner to validate the user to unlock the device. The fingerprint scanner is now positioned below the camera lenses to help prevent smudging from occurring. AR Emoji still needs some work, but with it you can do a rudimentary emoji of your face to use on different bodies. The Galaxy S9 Plus sports the same sized 6.2-inch Super AMOLED Infinity Display as the Galaxy S8 Plus, with Samsung’s usual improvements each year. Also the same QHD+ resolution of 2960 x 1440 pixels with 531 pixels-per-inch (PPI). The S9 Plus comes with an Always-On display that is more customizable than the P20 Pro. This type of display can help save battery life as well as a real convenience to the user. Samsung also redesigned the curved display, making it easier to pick up and hold without launching an app by accidentally touching the curved area. Gorilla Glass 5 protects both the front and back of the device. Many Samsung flagships use one of two different processors/GPUs dictated by where it is purchased. Galaxy S9 Plus models sold in the US/China use the more familiar Snapdragon 845 octa-core processor clocked at 2.7 GHz with a powerful Adreno 630 GPU for graphics. Models going to the EMEA countries use an equally powerful Samsung Exynos 9810 octa-core processor clocked at 2.7 GHz and a Mali-G72-MP18 GPU. Samsung increased the base RAM from 4GB to 6GB and the base storage to an expandable 64GB. Samsung also sells models with 128GB or 256GB of storage, but it will depend on your area and carrier whether or not you can order one. 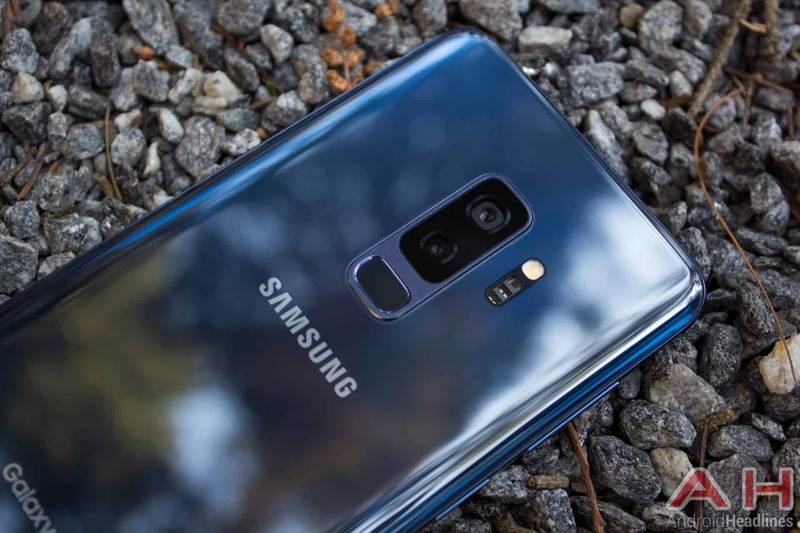 Dual cameras arrived on the Galaxy Note 8, so it was no surprise to see them appear on the Galaxy S9 Plus with several improvements. It sports improved Super Dual Pixels on a dual 12-megapixel camera setup. It packs PDAF, OIS, 2x Optical Zoom, 10x Digital Zoom, and an LED flash. But the most exciting feature is its new adaptive aperture – much like a human eye, the aperture will change from a large f/1.5 (low-light pictures) to a smaller f/2.4 (for bright situations). The second camera has a fixed f/2.4 aperture and is used for special effects. The front-facing camera (FCC) uses an 8-megapixel lens with an aperture of f/1.7 that includes auto-HDR and includes its own autofocus. When designing the S9 Plus, Samsung used the same battery in the previous Galaxy S8 Plus, a non-removable 3,500 mAh battery. Under normal circumstances this battery should last throughout the day. If you need to charge your battery during the day, you have a choice of using Samsung’s Adaptive Charge or quick wireless charging for a fast charge. Samsung always packs its flagships with lots of Samsung ‘goodies’ and the Galaxy S9 Plus is no exception. First, we have Samsung Pay that allows you to make mobile purchases from just about any place you can swipe a credit/debit card. To the right or left of the display (you choose) a side panel will appear for quick access to your most used contacts and apps. Samsung Health gives you a workable heart rate monitor, an SpO2 sensor, and a new blood pressure monitor. You’ll find Samsung’s Bixby personal assistant, and an improved Samsung DeX that allows you to transform your S9 Plus into a desktop computer. It comes with the new and less invasive Samsung Experience 9.0 (UI) on top of Oreo 8.0. The device measures 158.1 x 73.8 x 8.5 mm and weighs in at 189 grams. It comes in Midnight Black, Coral Blue, Titanium Gray, or Lilac Purple, with Samsung announcing a new Red version in China. Retail pricing ranges from $915 to $930, but there are quite a few promotions available. 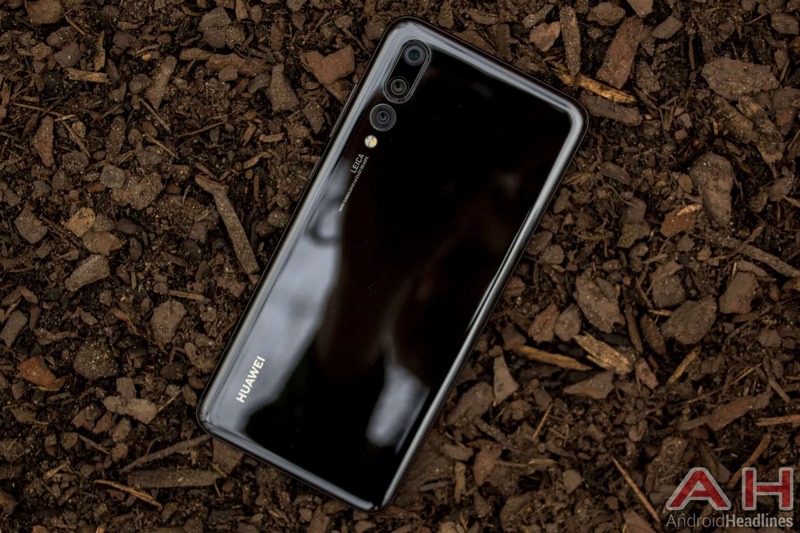 Huawei P20 Pro Huawei has always made a great looking smartphone, and the P20 Pro is a real beauty from every angle – rivaling the Samsung Galaxy S9 Plus – and includes one of the best camera setups on any smartphone. Its EMUI 8.1 sprinkles a light touch on Android’s Oreo making it one fast and smooth operator. The P20 Pro uses the latest HiSilicon Kirin processor, 6GB of RAM and 128GB of storage – but there’s no room to expand. There is no 3.5 mm headphone jack, but an NFC chip allows it to make mobile payments. The P20 Pro comes with an unprecedented three camera sensors, but still uses a FHD+ display and does not offer wireless charging even with a Gorilla Glass 5 back. The OLED display comes equipped with a notch. Priced at €899 ($1,055), it is a little on the steep side, but then so is the Galaxy S9 Plus ($930). The Huawei P20 Pro sports a notched 6.1-inch OLED display with a FHD+ resolution of 2240 x 1080 pixels with 408 PPI. It uses an Always-On display that helps save battery life and is a real convenience to the user – however, it is a basic design lacking any customization, and limiting the user to the current time and date. The notch is designed to be hidden, however, Huawei has also included such a tall display that the notch does not affect the experience with the apps able to take advantage of the 18:9 aspect ratio. Gorilla Glass 5 protects both the front and back of the device. Unlike the Galaxy S9 Plus that ships with different processors depending where it is purchased, the Huawei P20 Pro uses the company’s own HiSilicon Kirin 970 octa-core processor clocked at 2.4 GHz along with a powerful Mali-G72 MP12 GPU for outstanding graphics. The P20 Pro packs 6GB of RAM, but only 128GB on non-expandable internal storage and Huawei is offering no means to increase it. There are plenty of smartphones with dual cameras on the market, but the Huawei P20 Pro extends that to three rear-facing cameras. It sports a 40-megapixel RGB sensor with an aperture of f/1.8 along with Leica Optics, both laser and PDAF, an LED flash, and 3X optical zoom. The second sensor is a Monochrome 20-megapixel with an f/1.6 aperture. The third camera is also uses an RGB sensor with an 8-megapixel size, an f/2.4 apeture, along with a telephoto lens. The FFC is a huge 24-megapixel sensor with an f/2.0 aperture, allowing great selfies and video chats. Huawei included a large 4,000 mAh battery to power the P20 Pro. It’s non-removable, but does include Quick Charge 3.0 for quickly charging a low battery. We must point out that even with the Gorilla Glass 5 backing, Huawei did not include wireless charging on its premier flagship. The large battery should easily get you through a day of moderate usage. The Huawei P20 Pro has the usual suspects – WiFi, NFC, Bluetooth v4.2, and adds an infrared blaster. There is no headphone jack, but via a supplied adapter, you can get some High-Res sounds from a set good set of headphones, and good stereo from its stereo speakers. The camera is one of the best on the market with the addition of a monochrome camera, zoom features, and Night Mode. There is no Wi-Fi calling available and the P20 Pro is rated at IP67 for dust and water-resistance. The device measures 155 x 73.9 x 7.8 mm and weighs in at 180 grams. It comes in Midnight Black, Twilight Purple, Black, and Pink Gold. Retail pricing ranges from $900 to $1,055, but prices vary depending where you purchase it. As much as I thought that the Huawei P20 Pro was going to win this comparison, the winner is the Samsung Galaxy S9 Plus. The S9 Plus has the better display with a QHD+ resolution, no notch, and a more flexible Always-On display with more ways to customize the notifications. It packs an equally powerful processor/GPU and has the same 6GB of RAM. The P20 Pro wins out in the camera department with three sensors and one being a monochrome for true black and white shoots and an incredibly large 24-megapixel FFC. But the addition of the stereo speakers, Intelligent Scan, 3.5 mm headphone jack, better IP68 water and dust-resistance, heart rate monitor, SpO2 sensor, and being available for purchase on all major US carriers with specials running all of the time makes the S9 Plus a better buy. Both of these devices are beautiful to the eye and built like we would expect a flagship to look, but with them costing about the same price, the Huawei P20 Pro does not have more to offer. The P20 Pro does have a larger battery going for it, but no wireless charging. The only real reason to buy the P20 Pro is the exciting camera area with its monochrome capabilities and options galore. 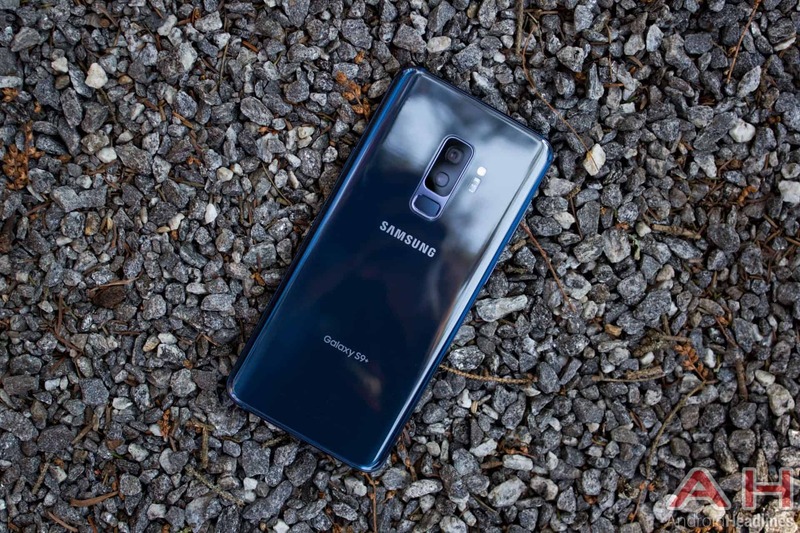 It costs the same as the Galaxy S9 Plus – in some cases even more – but offers overall fewer options when compared to the Galaxy S9 Plus. The post Phone Comparisons: Samsung Galaxy S9 Plus vs Huawei P20 Pro appeared first on AndroidHeadlines.com |.